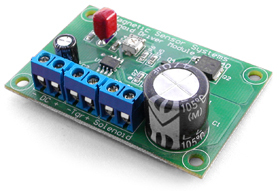 The PWM400 Module is designed to enable the user to convert the input voltage in order to apply a different voltage to the solenoid or coil. The output voltage to the coil can be adjusted up to the value of the power source by adjusting an on board trim potentiometer. The voltage within the above range can then be applied to the coil when a voltage (2 to 40 VDC) is applied to the trigger. 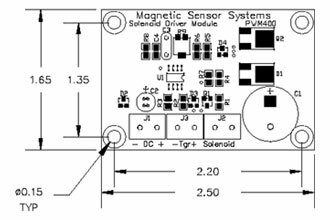 This is particularly useful when a solenoid requiring a relatively large amount of power needs to be turned on and off with a low power trigger voltage such as a TTL signal.